Elasticsearch provides a distributed, multitenant-capable full-text search engine with a RESTful web interface and schema-free JSON documents. It not only great for search, but also for extracting value out of all the maps that businesses are collecting. In Ramani Cloud we’ve made an API for 1) getting maps from PostGIS to Elasticsearch in a very simple way and 2) exposing the Elasticsearch search API in a secure manner. It's easy to get maps from PostGIS to Elasticsearch. It's actual just a click on a button. But first you can setup the mapping between PostGIS fields types and Elasticsearch fields types. 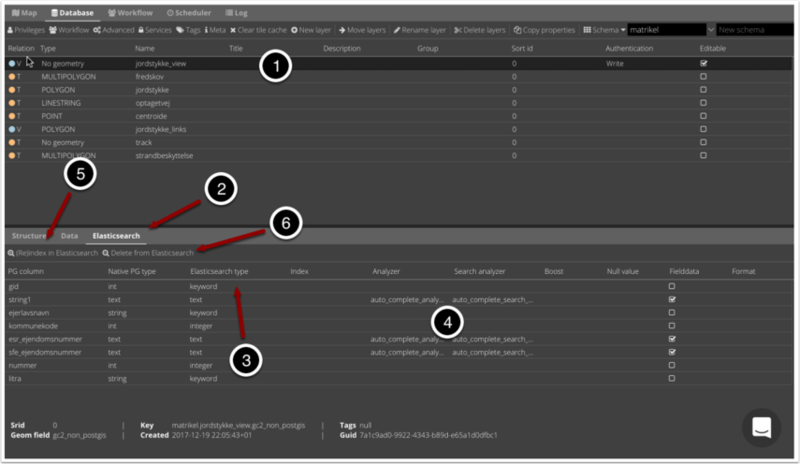 Click the Elasticsearch tab in in lower panel. The Native PG type column shows the field types in PostGIS. The Elasticsearch type column shows the suggested types in Elasticsearch. The latter you can change by double clicking on a value. The columns Index to Format sets how the values should be indexed, analysed, formatted etc. Look further down for more information about setting up custom analyzers. Click the (Re)index in Elasticsearch to index the data. If the index exist it will be deleted and indexed again. You can delete an Index by clicking Delete from Elasticsearch. Ramani Cloud exposes only the search API of Elasticsearch. You can use the Ramani Cloud API as you would use the search API of Elasticsearch. Below is an example of a GET with a URI search. The following examples use the cURL program, but any HTTP client can be used. If you host your own Ramani Cloud, you can setup Elasticsearch index settings including custom analyzers and search analyzers. The analyzers can then be selected in the Ramani Cloud Admin. All new indexes will be created with these settings.